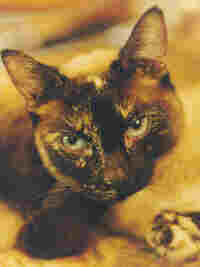 Amy is a tortie point, almost Siamese who talks too much. She has an opinion on everything. Thus, Alice thought she would be ideal for this job. When Amy was 11, she found herself abandoned with Willie, her life-long companion. They spent several weeks together in a cage. She had Willie climbing the walls and begging for a home. Fortunately, Amy and Willie moved in with several other cats, so Willie is no longer her only victim. Amy has decided to take up the advice column trade so she can make a virtue of what all the other cats (and her people) consider a vice. Write to AMY with any questions you may have about cats. If she isn't too busy bossing her people around, playing, sleeping, eating or grooming, she'll answer you. Her e-mail address is: Amy@SurroundedByCats.COM. Here are a few of the questions Alice and Amy have fielded so far with their answers. Why should I neuter my male cat? What toys do cats like? I'm thinking of getting a kitten. What do I need to know? Why should I feed canned food to my kitten? Help! I might be allergic to my cat! What should I do about vaccinations and my kitten? How can you tell how old a cat is? Why do some cats talk? Alice (?-1999) started in the advice business many years ago. 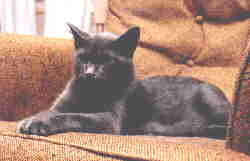 She was a gray domestic shorthair who would never tell her age, though she was in her twenties when she died. As a young cat, on her own and unable to arrange for a spay surgery, she became a mother. Later, she adopted other motherless kittens raising them as her own. Because of these experiences, she was an outspoken advocate of early age spay/neuter. She graduated from the School of Hard Knocks and began a life of leisure in 1982. She attended Kansas State University School of Veterinary Medicine in 1994. With her experience and education, she was ideally suited to answer questions about cats and kittens and so started an advice column. Before her death, she passed the torch to Amy who is a bit younger and perhaps a touch less wise than Alice.